Clash of Clans on Android tablet is so much fun than playing it on your typical smartphone or even on iPhone 5s which only sports at least 4-inch (diagonal) Retina display. Everything is feels better and bigger is you play the most popular game app Clash of Clans on Android tablet or even on Apple iPad. But of course, here’s one typical scenario that is more likely to happen especially during gatherings – sharing of devices like tablets. So, what if one or more of your friends or relatives wanted to play or boast his Clash of Clans (COC) but you only have one device, one Android tablet? What are you going to do next? For those who have been with this popular and one of the highest grossing apps, Clash of Clans are one of those games where it binds the user’s or owner’s account to the game – one device, one Google Play store account, one Clash of Clans account. And if you log out your Google Play account from the device, by then others can use it – but isn’t it a little bit tedious and time consuming? Another scenario is what if you own more than one Clash of clans which you have created from different Android devices and you want to consolidate them all and play it on one single device? 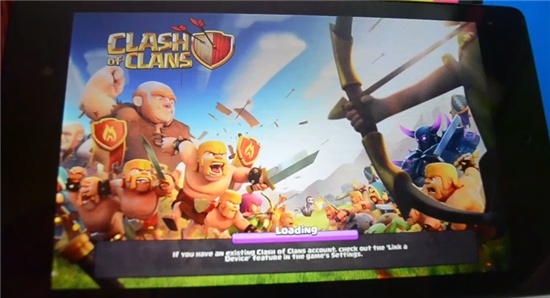 Don’t worry it is very possible to play Clash of Clans on Android tablet with multiple accounts. For those who does not know yet you can create multiple accounts on your tablet if you are now in Jelly Bean. If your Android tablet operating system version is now sporting Android 4.2 Jelly Bean or above then all you have to do is add your other existing Google or GMAIL account you are using for playing Clash Of Clans unto the Android tablet. The steps below have been taken and tested on Nexus 7 Android tablet with Android 4.4.3 KitKat operating system. 6. The succeeding steps will require the new added user to setup a new profile on the Android tablet device. 7. Upon confirming that you are about to create a new user or profile, you will be brought back to the main Window and show you a blank profile. Select and tap to that new profile to start creating the new account. 8. Sign-in using your Google or GMAIL account. 10. After you have completed the setup, you may now download Clash of Clans from Google Play. VIOLA! You now have multiple Clash of Clans on Android tablet device. And if you still have an issue creating a new profile or adding a new user on Android 4.2 Jelly Bean device then you can also check Android Police article where Multiple User Accounts have been one of the highlights of Android 4.2. Go ahead, try it and let us know how it goes! You dont need another profile for it to work. Just got to setting -> Accounts -> Add second Google account on which your second COC Base is. Then Open COC and your first account will load. Goto COC Settings, disconnect Google Account. Click same button again to connect to google account. The list will have your new account listed. There you have your second base running on same device. Do this everytime to swap bases. Works great on all my devices. Can now play mine and wife’s accounts from my phone or her tablet and vice versa. You have to type “CONFIRM” (without quotes, in CAPITALS). Confirm, confirm, ConFIrm… or something else will not enable the Accept button. For switching between 2 accounts using Google Plus, you need 2 or more accounts configured in your device. 1. Go to your device’s settings > Accounts > Add Google Accounts. — Now, add all the accounts you use to play COC. 2. Turn on game and login with first account. 3. Go to game settings. — Accounts entered in step 1 will be listed. 6. Select your 2nd account. 7. Load Village popup will show. 9. Enter “CONFIRM” (without quotes, in CAPITALS) in ‘Are you sure?’ popup. YOUR NEW ACCOUNT JUST LOADED. VOILA. Don’t forget to say thanks if it works for you. I didn’t gt popup of load village. Does it word for samsung tablets? When I go to switch to the other account and go to load the other account it tells me it will erase my village I’ve been working on for two years. Will it erase my higher village? I think there is another way to play Clash of Clans with multiple users. I will try it first and share with everybody. Hi Emilio, have you checked my last update below the article? I have an updated article that will give you a way to play Clash of Clans with multiple accounts in one device. OMG it says if you type CONFIRM it will delete your vilage and replace with the other one.. i dont want to take the risk! what if my village get deleted? Bug Thinkers article worked perfectly on either my android cell an Optimus L70 or my cheap RCA tablet or even on Bluestacks app player. I tested both methods of deleting the game data each time for each account I wanted to use or while in the game already deleting the account and reopening another account and I had no problem whats so ever. Its not really that hard to understand. All your doing in your settings on either a cell or tablet or bluestacks is adding an existing google account for clash. Then, using either method to play multiple clash accounts. Easy as that really. Now, I get asked how to do it and I just pass the knowledge on. Thanks Bug Thinker. When I choose the account and type CONFIRM the “okay” box is greyed out so I can’t click on it. Any ideas on why this might be? Hi Arsie, by following your post guidelines is there any chance that my phone can get corrupt? How to recover then? yeahh this method is really working on android devices. thanks for this guide. Thank you very much for your guide. It is working, I just go through all the steps and it will help me to run two coc accounts on one device.